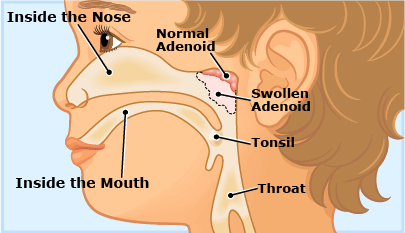 The adenoids are a mass of soft tissue behind the nasal cavity. Like lymph nodes, adenoids are part of the immune system and are made of the same type of tissue. Adenoids start growing from birth and reach their peak size when the child is between about 3 and 5 years of age. After the age of 7 they shrink, and are barely detectable during adolescence. They have disappeared completely by adulthood. Babies and very young children have undeveloped immune systems. At that age the adenoids are an important back up for fighting off infections. From adolescence, the immune system is better developed and they are not needed. Enlarged adenoids can be confirmed by inspection and or x-ray. If your child has been diagnosed with enlarged adenoids it is likely that surgical removal may have been advised by your paediatrician. Enlargement can be sufficient to cause a blockage of the nose making nasal breathing difficult or impossible. Chronic infection may also lead to ear problems including glue ear. These problems are seen by doctors as being indicative of dysfunctional adenoids with surgical removal being the best option for recovery. Adenoidectomy – is there a better option? The Buteyko Breathing Clinic programme is a safe and effective alternative to adenoidectomy. 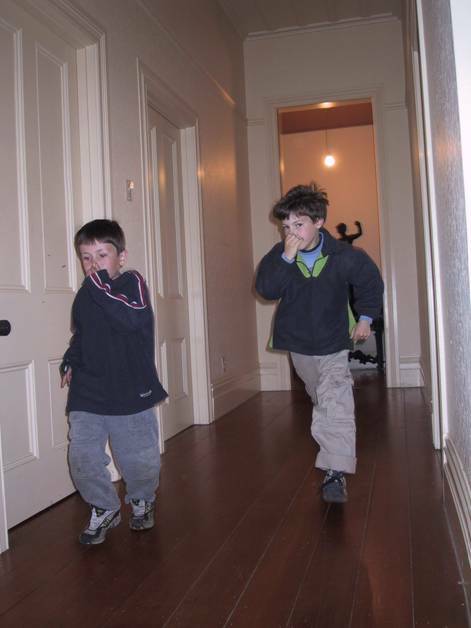 It is widely accepted that children with enlarged adenoids tend to be habitual ‘mouth-breathers’. However, contrary to popular thinking, habitual open-mouth breathing may in fact be the reason the adenoids become enlarged in the first place. Once enlarged, the adenoids make nose breathing even more difficult. Affected children develop a habitual mouth-breathing habit and this can result in craniofacial changes, including narrowing of the airway, leading to chronic nasal congestion and other upper airway disorders. The key to resolving this problem is in recognising that the mouth-breathing habit comes first. So, correcting the underlying dysfunctional breathing pattern is the first step to consider in reducing adenoids and making breathing easier. We will teach your child easy-to-learn breathing exercises which include games. This helps to normalise their breathing making nasal breathing easier. In some cases, dietary changes may be recommended to help with the process. Adenoid reduction, and with it the ability to nose breathe, is often seen in the first week of the programme. In many cases, adenoids return to normal size, within weeks, eliminating the need for surgery. We encourage all parents of children with swollen adenoids and chronic nasal congestion to consider the Buteyko breathing programme before embarking on invasive and potentially unnecessary surgery. Within days our daughter was able to breathe through her nose. This is something she hadn’t done for years. It is two months now since she did the course. Her adenoids have returned to their normal size and she now breathes through her nose most of the time, not all. 2 Bryars SG et al., JAMA Otolaryngol Head Neck Surg. 2018;published online June 7, 2018.